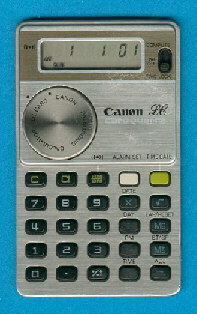 Size: 3.7" x 2.2" x 0.15"
This Canon card quartz LC-61T combines a basic four-banger calculator and a full alarm clock in a credit card sized housing known from the LC-6. It was available in a black housing, too. Don't miss the other LC-61T. One of its advantages compared to the similar Toshiba LC-854WA is the convenient access to the coin type lithium battery. The next step in the card quartz line is the remarkable LC-64T integrating a convenient calendar into such a tiny housing. © Joerg Woerner, March 28, 2003. No reprints without written permission.